Details at the end of this post on how to enter to win a copy of Cold Reign. We also have a link to order it from Amazon, and from an indie bookstore where a portion goes to help support KRL. The European vampire royalty have been going to visit for several books now, to negotiate and/or take over. Readers have been antsy and surly, waiting for it to happen, Suddenly, a storm of apocalyptic proportions arrives, and refried vamps (made undead, killed and buried, but recalled by their makers to animation and twice as mean) are attacking Necksucker Central, and there’s a ship that nobody can see anchored offshore. Guess what? The Europeans are already here. If you like urban fantasy battle scenes, you’ll find a bunch of them. If you like shape-changing demi-superheroes, this is the place. If you like a touch of hot romance between Jane and Bruiser, her vampire-blood-enhanced boyfriend, look no further. If you like to breathe easy, try Anne of Green Gables. Jane is learning that vampire politics is less campaigns and rallies than long-term plans that stretch over centuries, with the undead version of sleeper cells waiting to be set into action. The storm is messing with New Orleans’ drainage, since the city is already below water level. Jane’s employees, the Younger brothers, are hip-deep in the action. The super-hacker younger Younger is taking a more physical role as he grows up in body and attitude. Rick, Jane’s former guy, makes an appearance, but things are still prickly in that area, even if Jane has found another love. Here’s the deal on Cold Reign. Faith Hunter is still knocking ‘em out of the park, and now there are more runners on base, so she’s bringing home more scoring players. This book is so good I’m using baseball metaphors to describe it, and I don’t like sports! Read this book…and Play Ball! 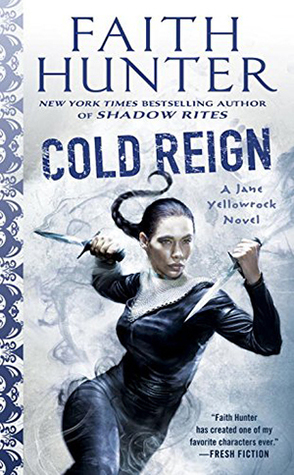 To enter to win a copy of Cold Reign, simply email KRL at krlcontests@gmail[dot]com by replacing the [dot] with a period, and with the subject line “reign,” or comment on this article. A winner will be chosen June 10, 2017. U.S. residents only. If entering via email please include your mailing address, and if via comment please include your email address. Love Faith Hunter. Good review. Can’t wait to read it. I really enjoy Jane Yellowrock and her adventures. I’m looking forward to reading this latest one. I love the Jane Littlerock series. I just move to the Bryn Mawr section of Chicago and don’t know where a bookstore is. I like to shop local. Is there a place near to me where I can get a copy? I would leave a gold scratch on a boulder but none around here. I truly enjoy this series. It’s got such a good heart. Usually, there is some deterioration in the quality as a long running series continues. I don’t know why, maybe the author just gets bored, the publisher gets pushy and wants the book too soon or whatever. This series actually gets better book by book by story by novella; pure quality. One of the few authors and series I’ve reread.